An engaging and hilarious collection that encourages readers to tackle those strange, awkward, worrying, yet endlessly compelling passages of the Bible. How do we come to grips with the Bible's troubling (or seemingly troubling) passages about the role of women? Why did the artist of the oldest known picture of Jesus intentionally paint him with a wonky eye--and what does it tell us about beauty? 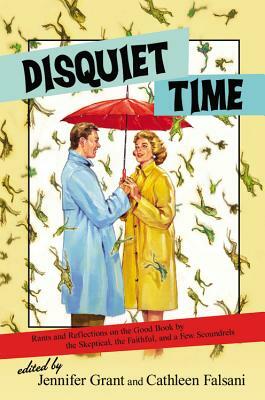 DISQUIET TIME was written by and for Bible-loving Christians, agnostics, skeptics, none-of-the-aboves, and people who aren't afraid to dig deep spiritually, ask hard questions, and have some fun along the way. Jennifer Grant has written numerous columns and feature stories for newspapers including the Chicago Tribune and is a regular contributor to Christianity Today's her.meneutics blog. Grant is the author of Love You More and MOMumental. She lives in Chicagoland with her husband and four children. Cathleen Falsani is an award-winning journalist and author who specializes in the intersection of faith and culture. She was the longtime religion writer and columnist for the Chicago Sun-Times, and has been a columnist for Religion News Service, Sojourners, Huffington Post, and the Orange County Register. She lives in Laguna Beach, California.